Cetaphil Dermacontrol Oil Control Foam Wash is clinically proven to effectively remove excess oil, impurities and make-up that can clog pores and lead to breakouts. 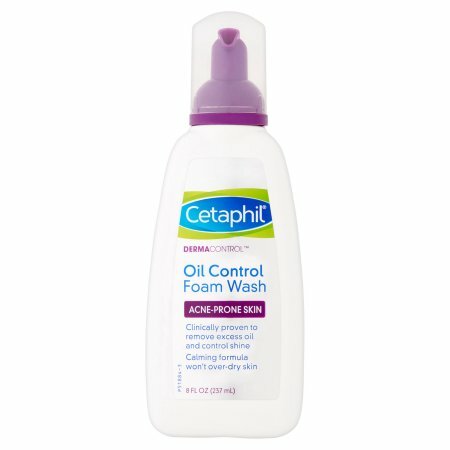 Formulated for acne-prone skin, this Cetaphil Oil Control Wash is gentle enough for everyday use. Cetaphil Foam Wash is designed to not over-dry your skin. Inactive Ingredients: Water, zinc coceth sulfate, glycerin, peg-75, dipotassium glycyrrhizate, zinc gluconate, peg-200 hydrogenated glyceryl palate, peg-40 hydrogenated castor oil, peg-7 glyceryl cocoate, sodium benzoate, masking fragrance, disodium edta. Ingredients: Water, Zinc Coceth Sulfate, Glycerin, PEG-75, Dipotossium Glycyrrhizate, Zinc Gluconate, PEG-200 Hydrogenated Glyceryl Palmate, PEG-40 Hydrogenated Castor Oil, PEG-7 Glyceryl Cocoote, Sodium Benzoate, Masking Fragrance, Disodium EDTA. CETAPHIL DERMACONTROL FACE WASH 8OZ by GALDERMA LABS,INC.